Diagnosis of pulmonary fibrosis is extremely challenging as it requires integration of clinical, radiologic and histopathologic information. Achieving an accurate diagnosis is more critical now than ever before, as emerging treatments are only available to a subset of people with PF who meet criteria for diagnosis and severity according to recent trial inclusion criteria. The availability of new, effective anti-fibrotic treatments has rendered existing guidelines inadequate for evidence-based care. 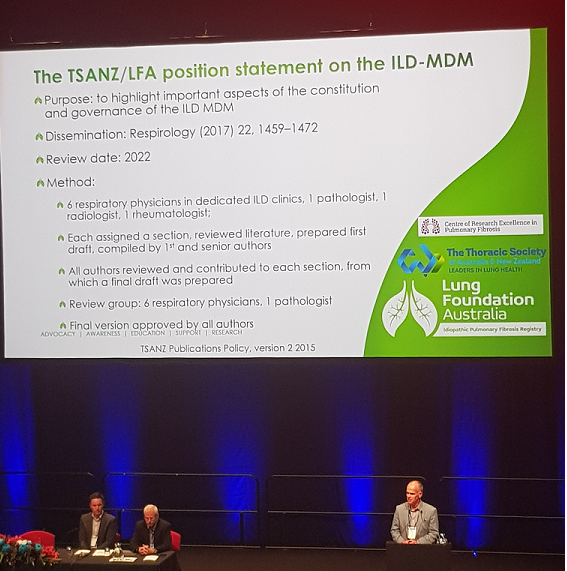 Position statements have been developed in partnership with the Thoracic Society of Australia and New Zealand (TSANZ) and Lung Foundation Australia, according to their established standards. These position statements cover the format, processes and outcomes of Multi-Disciplinary Meetings (MDM) for diagnosis of PF in Australia; and best practice PF management. Using our expertise in research translation we will use theory-informed strategies to implement and evaluate uptake of the information provided in these position statements for evidence-based diagnosis and management of PF in Australia. The impact of new MDMs on processes and outcomes will be evaluated through documenting the number of PF services using MDMs; the proportion of patients who are evaluated using a MDM; and adherence to key suggestions from the new MDM guidelines. The impact of PF management suggestions will be evaluated by a national audit of PF services against key recommendations for practice. A/Prof Ian Glaspole presenting at the 2018 TSANZ Annual Scientific Meeting. The interstitial lung disease MDM toolkit has been developed By A/Prof Ian Glaspole and Prof Anne Holland in collaboration with the Lung Foundation Australia. The toolkit contains resources designed to aid in the presentation and discussion of cases presented at ILD multidisciplinary meetings. The resoucres can be downloaded and saved for local use or used as templates to develop individualised documents. The toolkit resources are available to download now and are available here.